~ Making your own pickles might sounds like a P.I.T.A. but it’s actually quite simple and rewarding. Make the pickles on Saturday and have them ready and waiting for you at Sunday brunch. ~ If star anise isn’t already a common ingredient for you, it’s best to purchase them from a bulkbin at a spice store (like Penzey’s), asian market or health food store. You can purchase only the four you need for the pickles! Once, when I only needed a few, they weren’t heavy enough to register on the scale and the cashier just gave them to me for free. Hee hee. Peel daikon and carrots and slice into thin long matchsticks no thicker than 1/4 inch: I use a mandolin for this but you can take your time and use a chef’s knife. Or even better, use a Y-shaped julienne peeler. Slice the chilies in half, remove the seeds (or keep them in for really hot pickles), and slice into very thin slivers. Toss everything together and pack into a clean, dry 1 pint glass mason jar. In a small saucepan bring to a gentle boil the vinegar, sugar, salt, peppercorns and star anise and boil for 2 minutes. Stir to dissolve the sugar and salt and then pour everything over the vegetables in the jar, including the star anise and peppercorns. Cover very tightly and chill for 30 minutes before using. Keep tightly covered and chilled when not using. Heat a wok or cast iron skillet until nearly smoking, then sauté mushrooms with 1 tablespoon of oil until tender and browned, about 4 to 6 minutes. Remove from wok, wipe down the surface and add remaining oil. Add the shallots and stir-fry until golden, about 4 minutes, then add white parts of scallion and garlic and stir fry for 1 minute. Crumble in tofu, add the mushrooms and stir-fry for 2 minutes. Whisk together vegetable broth, soy sauce, lime juice, coriander, white pepper, and curry powder and pour over tofu. 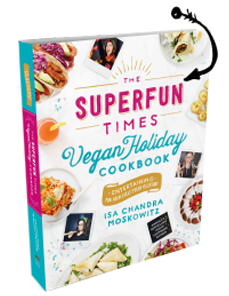 Use a large wooden spoon or rubber spatula to stir fry tofu until all of the liquid has been absorbed and tofu is golden, about 8 to 10 minutes. Tofu should be moist, but not wet. Add the green tops of the scallions, fry for another minute and remove from the heat. Slice rolls in half and toast if desired. Spread insides with mayo and distribute the tofu evenly on the sandwiches. Top each sandwich with cilantro, tomato, radish, chili sauce, and daikon pickles if using. Eat immediately but over a plate…these are messy goodness. This looks ridiculously good. I love the flavors. I pre-ordered it yesterday. So excited! I can hardly stand to wait! 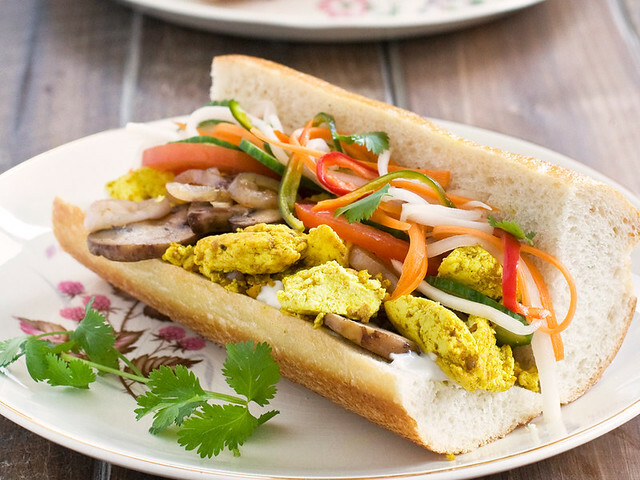 I love vegan versions of Bahn Mi sandwiches! I’ve got some daikon and some carrots from my CSA this week, and I think I’ve got a few pint jars left, so, it’s lookin’ good for pickle makin’ on the homestead! I cannot wait to get this book!! I just tried the pickle recipe to go along with a different (non-breakfast) banh mi recipe I like and they were delicious! I bought a julienne peeler just for the recipe but it’s something I can see myself using for other recipes and I am very excited about it. The only change I made was to add 1 cup of water to the liquid mixture and then bringing it to a boil. Other pickle recipes I’ve seen use equal parts vinegar and water. They still “pickled” and were tasty. Delicious. The pickles were easy, took the advice to make them the day before. Otherwise would have been way too much for a weeknight. Required a purchase of a mandoline but pretty cheap and i think the ability to julienne may change my whole take on salads, so def worth the 15$ at crate&barrel! Really lovely mix of favors–have to admit I doubted at first but it was great. This looks like a delicious veggie sandwich. Maybe this one will convert my tuna-sandwich loving boyfriend. But what is Kosher salt en why is ‘normal’ salt not suitable for vegans or Jews? My Favourite Cookbooks (and How to Slim Down to 10) « the taste space – steam, bake, boil, shake! I just recently heard about bahn mi sandwiches! So excited to try this! Thanks for sharing! My pickles were not so tasty. Super salty with a funny aftertaste. I wonder if adding water would have helped. I love pickles and I love salt but this was over the top. I’ll try again to see if I made a mistake somewhere. Great lazy Sunday breakfast, pickles were a hit and a new addition to just about every meal from now on. Didn’t have a mandolin, but one daikon and one large carrot don’t take that long to slice up. Delicious! WOW. I just made this tonight and it is one of the best things I have ever cooked!!! Epic! So satisfying to put work into a recipe and have it come out amazing! THANK YOU for this recipe!!! I took some photos of how it turned out and posted it to Instagram, feel free to just search the hashtag of your own names of you can find me at 77_cool_J. Looking forward to trying more great recipes from you! Just made this and was blown away. I made the pickles last night. Instead of bahn mi style, i went burrito style, but did everything else the same. This dish is not for the faint of flavor! It is packed to the rafters with edgy flavors. Since ditching animal ive found my tastebuds appear more sensitive and the flavors i experience on a daily basis are mindblowing. You need to make this. As long as you do your mis en place it comes together very fast. I love this Scramble Tofu! My favourite breakfast!